This publication is the result of the work of 10 years of research by amateurs from the Historic Center of Mexico City who dedicated themselves to creating this reference guide for passers-by in the Mexican capital. 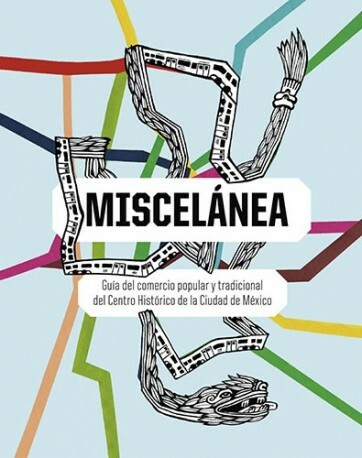 Miscelánea is a guide to the popular and traditional trade of the Historical Center of Mexico City, useful, proactive and critical that allows finding specific products and that details, anecdotally, the history linked to these products, buildings, neighborhoods and markets. Originally, through short texts, photographs and maps one can walk the streets of the Center and discover the daily activities of its inhabitants. The reader learns to see the Center with another look and to marvel at the small details that surprise him. It is a guide for curious "travelers" who want to discover and explore the Mexico of everyday and popular life in an authentic way. In addition to the guide, a drop-down map of the Center and independent of the book, allows the reader to move through the streets and locate the highlighted places. Fabrizio Mejía Madrid. Antonio Calera Grobet.